Intel and Micron are blurring the lines between memory and storage with their new 3D XPoint designs. Although a lot of people misunderstand the tech, it is not flash, not even close. The new 3D XPoint, pronounced “crosspoint” memory is a new type of device, it is not flash, not DRAM, but somewhere in between. SemiAccurate told readers about this, in code name form rather than marketing name, over two months ago. XPoint is a 3D memory, the current product is 2-layer, but it’s properties also straddle that middle ground. Lets take a look at what it is, what it isn’t, and what it could be used for. 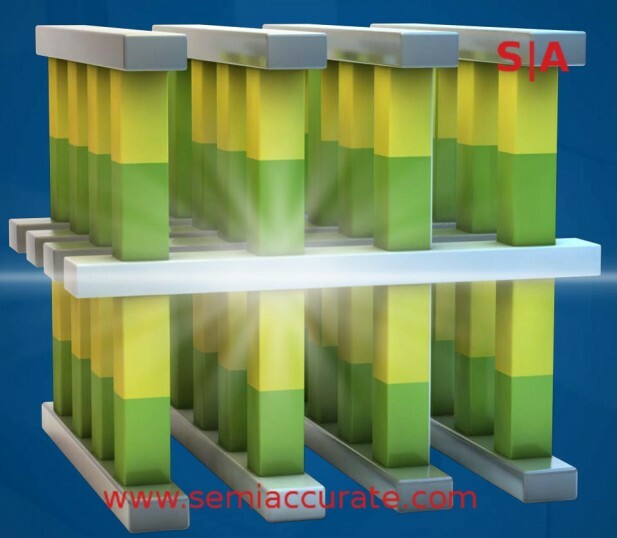 Starting off at the cell level, XPoint is a phase change memory specifically resistive memory or ReRAM. Intel’s Al Fazio was quick to point out that most ReRAMs use a filament design for the resistive element, XPoint uses the bulk material as the element. This has profound implications for write lifetime, a filament wears out quite a bit faster than a block. In either case the idea is the same, the part between the two electrodes changes resistivity and that is read off as a 1 or a 0. We did ask about multi-bit cells and Intel claimed it was quite possible to do 2-bit and possibly higher cells with the XPoint designs. The current 2-layer devices are about the same density as flash, 128Gb, so keeping up with the ‘competition’ will be quite possible. Naming the memory XPoint comes from the structure as you can see from the diagram above. You have traces in one direction, a cell, a select device, traces in the other, and another cell, select device, then back to the original orientation. One thing we didn’t ask is if the center lines are shared among the two cells or if that was just a diagrammatic optimization. In any case the fundamental unit is one layer deep so you can have odd-numbered layers if you want. The first device from Intel/Micron is two layers deep but that is not a constraint, it is just this device. When talking about the development process, one of the hardest parts was said to be the select device, aka the cap. When you send a signal down a line and expect to read it out on the corresponding line that intersects the bottom of the cell, you need to somehow shield the other cells on the same line from that signal That is the select device and as you can tell, it does what its name suggests and is the control mechanism for the memory. How the cells work, what materials they use, and many of the details were not disclosed but you can work some of them out from the basic tech. Since XPoint is a ReRAM you would be pretty safe guessing that it works by running a large charge through the cell material to change its physical state and thus its resistivity. Since this is a chemical change to the material induced by charge or likely heat, the properties remain after the charge is removed, hence the NV portion of NVRAM. That is the long way of saying it retains its contents without power. When it needs to be read back, a lower voltage signal is used and the resistivity of the element determines whether it is a 1 or a 0. Extrapolating this to 2-3 bits per cell is pretty straight forward, the problem is the same as in MLC/TLC flash in that you have to figure out the magnitude of the result to get your value, not just on/off. That is the basic XPoint cell and how it works, so what does it do? As we said earlier it is somewhere between flash and DRAM in most ways. Intel claims 1000x faster than NAND flash, 1000x the endurance, and 10x denser than DRAM. Lets take a look at these claims individually because they all have different impacts. Other types of NVRAMs will have different properties making them suitable for other markets. 1000x faster than NAND put it in the middle ground between flash and DRAM for speed, flash is in the microsecond range, XPoint and DRAM is nanoseconds at the cell level. Organization plays a large part of the user visible result and in that case, XPoint is much more akin to DRAM than flash, it is word read and writeable, not block level like flash. This also means it is significantly wider than flash on an interface level but that structure was not disclosed yet. In short speed comes from both fronts. Next up is the 1000x endurance claim, and that is stacked against current flash devices which have lifetimes in the thousands of writes. The math suggests XPoint will have a write endurance in the millions of writes, still good but not enough to allow it to survive as a main memory type. With a controller that does adequate wear leveling like modern flash controllers, the number on a device rather than a cell should be much higher. Add in the lack of write amplification caused by block writes and XPoint devices, not cells, should outperform flash devices by more than that margin. Then comes the density, a critical factor in determining market success. Normally a new device type starts out slower or less dense than the market champion, sometimes both. This limits success until speed and density catch up with the incumbent. Since XPoint is not flash and not even close to it, initial devices are at the same density as flash, much higher density than DRAM, and speeds between. Starting out with 128Gb chips will mean it will support the necessary capacities to replace flash when it first goes on sale. That brings us to the first down side, price. Intel would not say what the price of XPoint would be but it was hinted to be in a range between flash and DRAM, what a surprise. Because of this you won’t be seeing XPoint USB drives and are unlikely to see XPoint SSDs for the consumer market, it will be limited to high-end performance critical storage applications with interfaces that can support the speed. And can support the cost. Lastly we come to power, something that again is better than flash. The power needed to write an XPoint cell is about the same power needed to write a flash cell but since XPoint is so much faster, energy used is lower. You can also write more cells per second at that speed so energy use is, lets call it an open question until devices are announced. You could also say that for similar use cases, energy use should be similar to flash or lower. The current XPoint devices were built on a 20nm process and should scale with each new node, and scale vertically too should there be a need. That will allow it to maintain its density parity with flash, possibly speed up a little, and have little impact on endurance. This is a win/win/win, win/win/win/win if it drops price which a shrink likely will too.